NOSA: From Smoqshaq in greater Lekki to Rhodes in Alausa, American-stye barbecue has slowly found its way into Lagos. Even BBQ & Cravings has added slow cooked ribs to menu. This week, we checked out another entrant - Brooklyn Bistro. FOLLY: Brooklyn Bistro is a very humble space so it’s advisable not to go in expecting a fancy restaurant or the full works (at least I didn’t) or you’d be mighty disappointed. The entire restaurant has about 3 tables and the bar so it’s very small. NOSA: Fitting ten people in there might stretch its limits. That’s how small, I mean “cute”, it is. I know that reads like shade, but I actually like the spirit of the place. It’s certain character to it. It has that “my first business” vibe and in this economy, it’s something I rate very highly. The menu isn’t particularly extensive, your barbecue choices are confined to chicken wings, ribs (beef or pork) and brisket. After our visit, they revamped the menu a bit however. Added a couple new wing flavors and combos, but nothing particularly significant so we aren’t dated lol. The sandwich was the most disappointing of the lot and I’d rather not dwell on it. 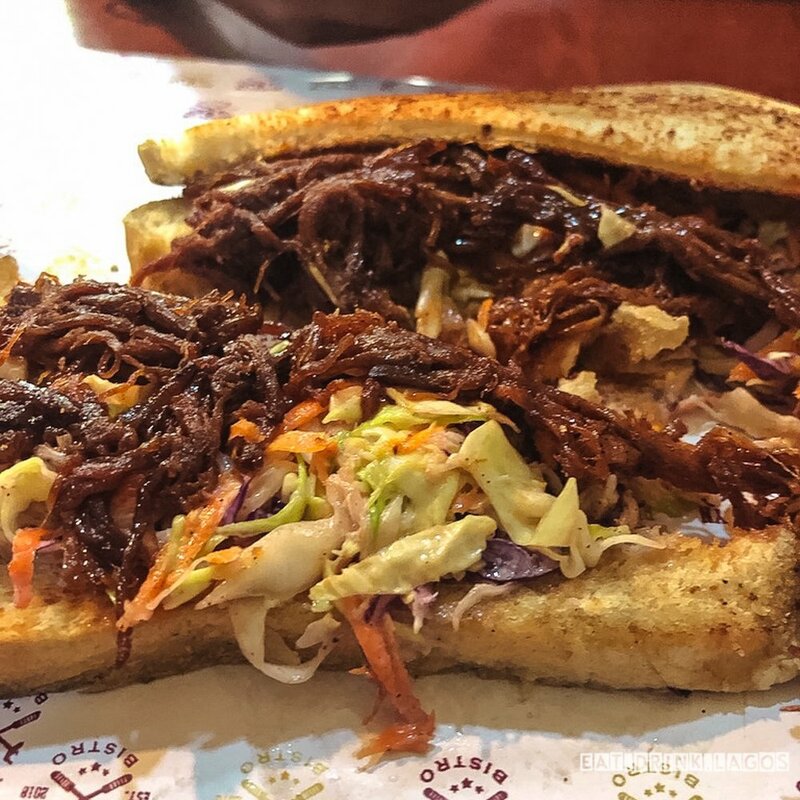 FOLLY: The pulled meat was way too tough to be called brisket and the bread, well, that was a soggy mess. The bottom slice had completely disintegrated by the heaviness of the sauce and couldn't; be picked up. NOSA: I liked the brisket, but they went with the wrong bread type. I’d have gone with a burger bun and not regular toast. And if I went with toast, I’d lean towards something thicker like Texas toast. The coleslaw and brisket are way too moist for the bottom slice to survive. FOLLY: The wings were good. The meat was very tender and the flesh slid of the bone without jerking and tearing. I was not adequately whelmed by the sauce. It tasted like a bottled barbecue sauce that had been upgraded with Cameroon pepper. NOSA: Same sentiment on the wings, but we’ll get into the sauce when we talk about the ribs. FOLLY: The soggy fries were disappointing and the Mac N Cheese, I prefer not to speak because I’m not supposed to be eating dairy. However, if I must speak on it, it was macaroni combined with cheese. NOSA: The Mac n Cheese was more of a Penne Alfredo to be honest. Very “moist” for lack of better word. FOLLY: Moving on to the ribs. Again, grade A on tenderness as every bone pulled out clean. NOSA: This is exactly how all ribs in Lagos should work. FOLLY: However, the cut wasn’t great because it was a lot more fat than meats in parts but nothing I’d really complain about for more than a sentence. NOSA: The ribs are bit interesting. The technique on it was great, but it tasted a like it was marinated with something from a bottle. A bit too sweet at points. FOLLY: Again the artificial taste in the sauce reared it’s head. It tasted really artificially sweet and at the same time quite acidic. So I concluded that it was either one of two things, they simply used a bottle barbecue with Cameroon pepper for the heat or they attempted to make theirs and they was just way too much ketchup and vinegar in their recipe. NOSA: The food at Brooklyn Bistro was good, but not great. Like, imagine a friend’s mother that’s a really good cook. You love her food, but you’d never think of eating her dinners at a restaurant. That’s what Brooklyn Bistro feels like. FOLLY: Honestly wasn’t one of the better barbecue experiences that I’ve had in Lagos. NOSA: There’s definitely room for growth and I’m a bit optimistic because there’s just something about the place that I like.